Defense wins championships. It’s the type of mentality that every team lives by; some more than others. Simply, defense not only wins games, it wins championships. “Since we’ve been here we’ve told them defense wins championships,” said Head Coach Dan Gomez. That thought process was on full display this past Friday night. The Greyhounds managed to shut out the Harlingen South Hawks, dominating them by a score of 28-0. 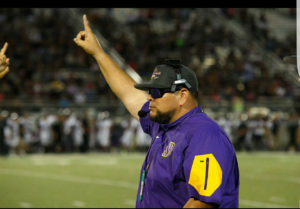 Both teams previously met on week 10 of last season, where San Benito pulled out a 17-13 victory on Homecoming night. This year, the Hawks hoped to avenge that loss, but San Benito wasn’t having it. Absolutely not. Normally a receiver on the offensive side, coaches quickly decided to put in #82, Isaac Pope on defense. Pope was the hope the Hounds were looking for, blanketing De La Rosa for the rest of the game. With the wheels rolling, Linebacker Emilio Garza managed to force a fumble deep in Hawk territory. The Hounds recovered the ball at the Hawk 8-yard line. Retta was able to capitalize off the turnover with a 5-yard touchdown pass to #90, Avelino Garcia. Retta managed to throw an additional touchdown early in the 2nd quarter. #4, Tyrone Harper flared out to the right, Retta scanned the Hawks defense and threw a dart to Harper. The speedy junior managed to take it to the house on a 46-yard TD pass, bring the score to 14-0. Retta wound up 11 of 16 for 108 yards with two touchdowns and had no turnovers on the night. Retta managed to put together a solid performance on an important district game. Harper contributed on the ground with 14 rushes for 60 yards and another touchdown, two for the night. Backup running back, #30 Marcelino Morales saw brief action, contributing an additional 3 rushes for 6 yards and one touchdown. With this victory, San Benito is inching closer to a third straight division title. There’s just one problem… The Cardinals are in the mix as well. Their district record stands at a perfect 4-0, tied with San Benito. Both teams have two games to go before they meet each other in what is shaping up to be the most anticipated Battle of the Arroyo in recent memory. The Greyhound’s next opponent: Brownsville Hanna. The Hanna Eagles are coming off a 34-31 loss to Los Fresnos, putting their district record at 2-2. “They’re another tough team in our district,” said Gomez. “We’ll be ready for them come Friday.” The game will take place at Bobby Morrow stadium on October 21, 2016 @ 7:30pm.